This recipe is a little different. Spicy? Yes. Sweet? Yes. Nutty? Yes. Packs a flavor punch? You betcha. In fact, when I tried the glaze the first time, I was a little worried that it would be too spicy for the average person. I needn't have worried. 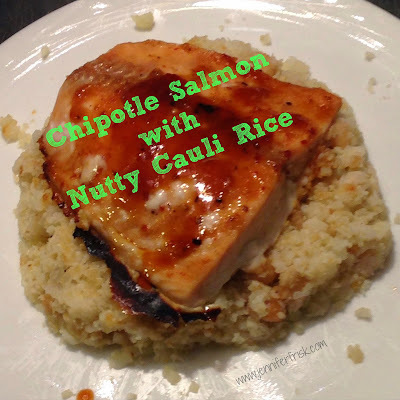 When paired with the "rice" and the salmon, the spicy glaze mellowed into the perfect complement to the rest of the meal. Oh, and cauliflower rice? Who knew? Cut cauliflower from core and place in a large blender or food processor. Process until cauliflower resembles grains of rice. Be sure there are no large chunks left. Spread cauliflower on rimmed cookie sheet in a single layer; sprinkle with garlic powder; and bake 15 minutes. Toss "rice" at least once to prevent sticking. Blend honey, soy sauce, chipotles and sauce, and lime juice until smooth. Place salmon filets on rimmed cookie sheet and sprinkle with salt and pepper to taste. Lightly glaze each filet with prepared sauce. Bake salmon 10-15 minutes until fish is opaque. While rice and fish are baking, heat remaining sauce in a small saucepan until boiling. Continue to boil until sauce is reduced by half. When rice is done, combine with nuts and divide into 4 servings. Top with salmon. Drizzle reduced glaze over salmon, and serve! Will you try it? Let me know what you think!